A 'Land Hurricane' Strikes States From Midwest To East; New Storms Predicted : The Two-Way A huge system of thunderstorms called a derecho plows through several midwestern and southern states, killing several people, causing heavy damage and cutting electricity to millions. More bad weather is predicted. 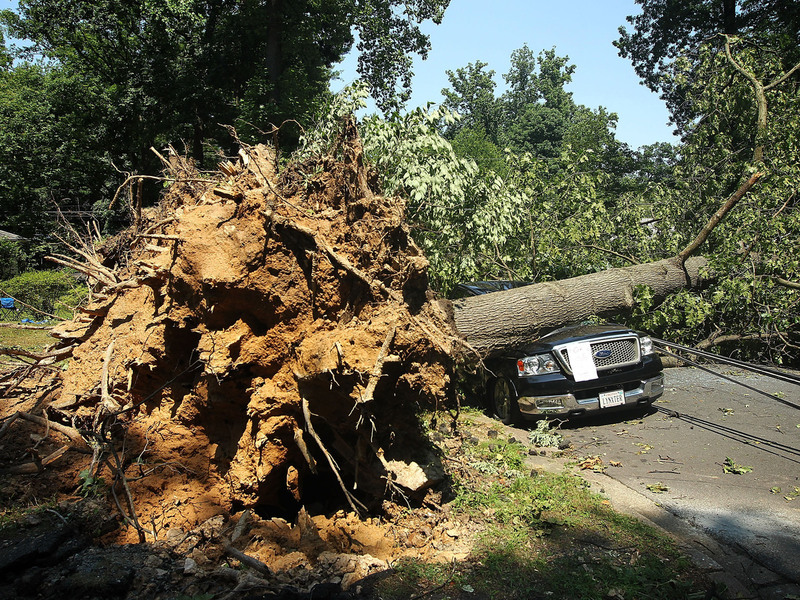 A downed tree lies on a truck in Falls Church, Va., after a powerful storm struck the area on Friday. A powerful series of storms blew through several eastern states late Friday and early Saturday morning, killing at least nine people and throwing at least 3 million people into the dark. This unusually damaging system is called a derecho, notes AccuWeather (it's pronounced deh-RAY-cho). According to the National Weather Service, a derecho is a gigantic wind storm coupled with thunderstorms. These are as powerful as tornadoes, but they don't twist; they drive in a straight line. They're described as land hurricanes because they have wind gusts of at least 58 miles per hour and higher. Meteorologists with the Washington Post say derechos get their power from hot, humid weather. That's exactly what was going on when the storms blossomed above regions setting heat records or getting awfully close to them. It all started late Friday morning outside Chicago as a cluster of thunderstorms, says the Weather Channel. The bad weather plowed south and east, hitting Indiana, Ohio, Kentucky, West Virginia, Virginia, Maryland, the District of Columbia and New Jersey. Increasingly violent storms downed power lines, yanked roofs off houses and toppled trees that crushed people beneath them. Several states declared states of emergency and President Obama signed a disaster declaration for West Virginia. Friday's storms didn't cool temperatures — in fact, the Weather Service expects record-high temperatures to continue from the Mississippi River valley up through the Mid-Atlantic states. Powerful winds blow the camera as storms strike north of Columbus, Ohio.